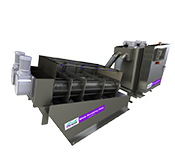 PWTech Volute Dewatering Press: Innovative dewatering drum for both thickening and dewatering of a wide range of sludges in a single, compact operation. This innovative sludge dewatering product offers many advantages over conventional sludge management methods. to the process is the unique dewatering drum design. This drum is able to achieve both thickening and pressing (dewatering) of the sludge in a single, compact operation. It can take sludge as dilute as 0.1% solids, directly from a biological process, such as an oxidation ditch, and produce a cake of over 25% solids. Download our product flyer for more details on system operation. 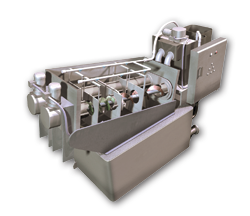 The Volute Dewatering Press is a fully automated system capable of starting up, operating, and shutting down with no operator intervention. This is possible because the control panel is designed to control the operation of wasting sludge directly from the biological processor or clarifier, the automated polymer feed system, flocculation, dewatering, and any conveyors required to remove dewatered cake. Thus, all components of the dewatering system work together, automatically starting up, operating, and shutting down as required. PWTech can provide complete systems or work with other suppliers to provide an integrated package. In addition, unit operating and alarm outputs for connection to plant PLC/SCADA systems are standard. Several models are available. Download our product flyer for a list of available model sizes.